Vybz Kartel shared his reaction to Mavado’s shooting incident. 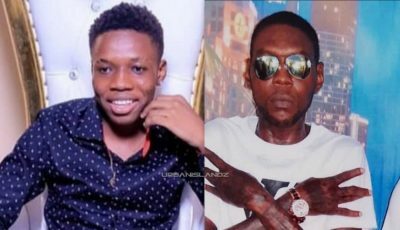 Over the past week, Vybz Kartel fans have been trolling Mavado on social media after the Gullyside singer was shot at in Cassava Piece. The Gaza deejay, who has a “frenemy” type of relationship with Vado, has weighed in on the Gram and he is pretty much trolling the singjay just like his fans. “doooont run,” Kartel wrote on IG in a post that has since been deleted. 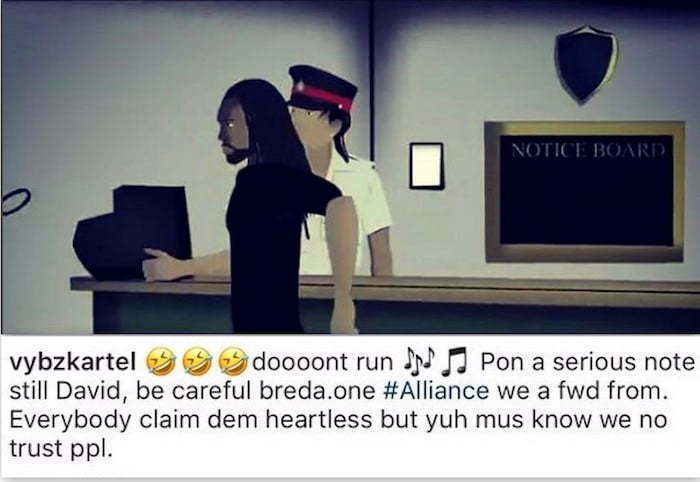 Kartel also posted a cartoon of Mavado meeting with police officers. Vybz Kartel himself is currently serving a life sentence for a murder conviction. His appeal trial is coming up next month. Mavado is preparing to face police officers who say they want to question him regarding a reprisal killing in Cassava Piece last week. His 17-year-old son, Dantay Brooks, is currently in police custody. Yesterday, police officers issued a final warning to Mavado to turn himself in or else he could face arrest in the United States and possible extradition to Jamaica. The singer’s attorney, Tamika Harris, says she has been in contact with the artist and assured cops that he will turn himself in as soon as possible.